Every Porschephile is familiar with the notion of RS. The marque’s Rennsport models are modestly (and sometimes not-so-modestly) disguised race cars built for the street and track. Most are rarer, lighter and more powerful than the standard variant from which they evolved. And now, most are frightfully expensive. One could legitimately call many of the four-cam 356 Carrera models the original Rennsport; certainly the formula was well distilled by the 911R of 1967, although that was unabashedly a race car with no attempt to disguise it. Then the Carrera RS 2.7 came along a few years later, and you know much of the rest of the RS’s upbringing. Porsche has developed a variety of Sport models over the years without use of the Renn designation. There have been Sport iterations, and others optioned with Sport Equipment. By the time the 1984-’89 Carrera was reaching middle age in its product lifecycle, Porsche’s sales and marketing folks were missing a bit of that RS magic. Of course there was the mighty Turbo–and the muscular-looking M491 Turbo-Look Carrera, but it was neither lighter nor faster than the standard model (although it benefitted from some of the Turbo’s upgraded suspension bits and brakes). The product boffins dreamt up a new idea called ClubSport. The notion was a lighter, racier, simpler 911 targeted at the weekend racer–a faster version that could be built without a lot of costly specially tooled components. In fact, most of its makeup was achieved by decontenting. Out came Porsche Product Development’s X-Acto knife, and off came the equipment and the pounds. Porsche ditched the a/c and all of its associated heavy hardware. The audio amp and speakers were equally binned, along with the back seat and most of the sound deadening. Power windows? Central locking system? Who needs ’em? Out! Power seat adjusters also hit the bricks. Bits and bobs, such as the clock, disappeared. The grams continued to fall off in the search for a 911 that was lighter and more lithe, yet still street-legal and streetable. didn’t offer the Carrera’s sideview mirrors without power controls, and to tool them up would have cost more money and not resulted in any meaningful weight savings. Depending upon which story you read, the weight savings from all these austerity measures was about 100 kilograms, or roughly 220 pounds. The powertrain remained architecturally stock–except that the well-developed Carrera 3.2-liter flat-six got a little balancing, blueprinting and extra-careful assembly along the way. Plus, the engine management system was re-profiled to allow a minusculely higher rev limit, up from 6700 rpm to 6840 or 6850–again, depending upon what you read. Horsepower was never officially rerated–likely to avoid having to recertify the emissions and engine package–but it’s agreed that the extra revs and careful engine build were worth 10 to 20 ponies. Thanks to the generosity of the uberfriendly Achim Stejskal, director of the Porsche Museum in Stuttgart, we sampled the factory’s own Carrera Club Sport prototype. Physical differences show themselves immediately. The car wears standard-width Carrera 3.2 coupe bodywork with a rubber-lipped, non-Turbo, tea-tray rear wing. It did borrow from the Turbo a pair of the black, rubberized “stone spats” on the leading edges of the rear fenders, just aft of the door cuts. It has standard 16-inch Fuchs all around, with white centers and satin polish-finished rims. Something is funny in the bumper and fascia departments; these units somewhat resemble 964 pieces, although they are not. A little digging confirms that Porsche contemplated using these special bumpers, but they never got the green light due to cost and crash cert implications. Production CSs wore standard Carrera 3.2 bumpers, sans fog lights. The expected “pixel print” CS graphics adorn the left-front wing and right-rear C-pillar, although it is unusual to see them in black. A hop inside the stripped-down cabin reveals a Type 915 transmission shift pattern, confirming that this car was based on a 1985 Carrera. 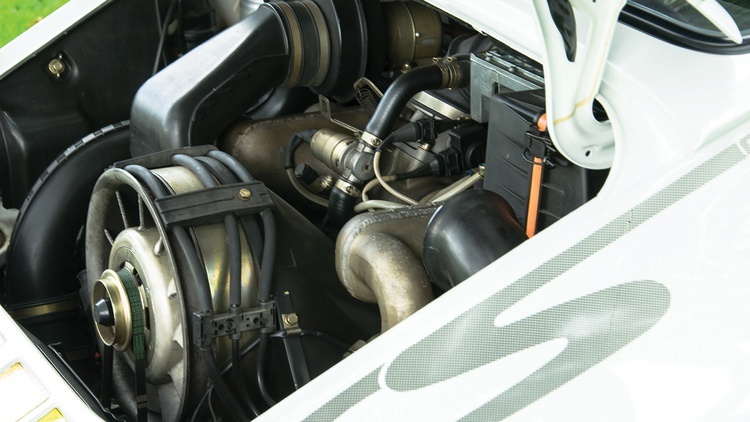 The production Club Sports were built on later Carreras and carried the G50 transmissions. 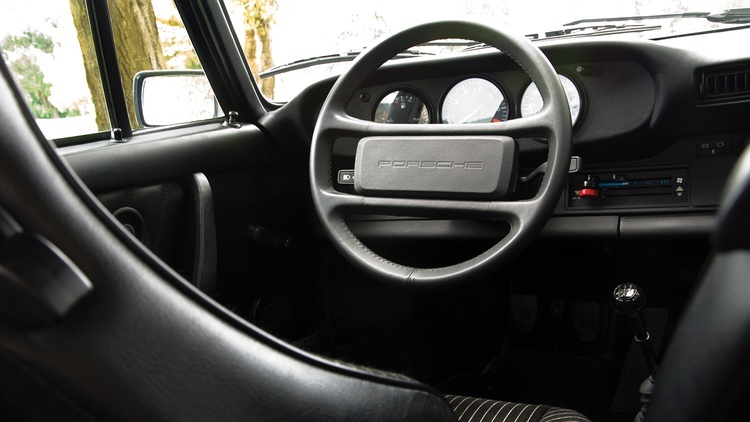 At first it’s a little off-putting to see only a three-dial instrument panel in a later 911–missing is the clock and the oil level gauge normally found at the far left of the panel. The engine lights easily and settles into its familiar chuffy burble. Once the fluids are up to temp, it’s foot to the mat and near seven grand in every gear. The 915 trans feels up to the job, although the centering spring is perhaps a little worn or weak. This car feels sprightlier than the typical heavily optioned 3.2 and a bit more responsive to steering wheel commands. That’s the magic of the better power-to-weight ratio as well as the more finely tuned engine. There are no cornering opportunities during our brief drive through speed-monitored Carmel Valley, but we’re sure a few laps around a road course would further confirm the validity of the Club Sport formula. The story behind this rare bird’s restoration is an interesting one. Stejskal found it in a factory warehouse, complete but worn and tired. He felt the car’s provenance should be shared in the Porsche Museum, but his small museum workshop didn’t have the staff needed to restore the car. So he put a call out among Porsche employees and local Porsche club members for volunteers to bring the car back to life; the company would provide the parts and materials. It worked. The car is fully restored to its 1985 condition, and everyone who had a hand in the job autographed the underside of the front decklid. Porsche produced just 340 copies of the 1988-’89 Carrera Club Sport back in the day. All were coupes, sans sunroof, and none were Turbos, Targas or Cabs. There was but one prototype for this rare and interesting model–and this is it.